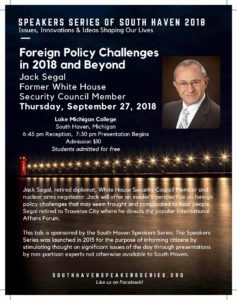 Jack Segal, retired diplomat, White House Security Council Member and nuclear arms negotiator offers an insider’s perspective on foreign policy challenges that may seem fraught and complicated to most people. Segal retired to Traverse City where he directs the popular International Affairs Forum. Segal also draws on his experience in the Middle East, Afghanistan, and Europe. At the U.S State Department he specialized in nuclear security and disarmament. Among his notable assignments are the White House National Security Council from 1998 to 2000; Political Advisor to the NATO Commander for Afghanistan; Military and Political adviser in Israel during the Palestinian uprising and the Gulf War; and a State Department representative to the START nuclear arms reduction negotiations with Russia. 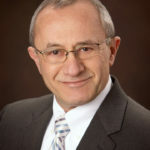 Segal moved to Traverse City in 2010 where he now directs the International Affairs Forum with his wife, Karen Puschel, also an experienced diplomat. Segal is a Vietnam infantry and paratrooper veteran who earned a Bronze Star and Meritorious Service Medals. After his years of diplomatic service, he’s a firm believer that diplomacy usually trumps bullets. Segal will be the fourth of the 2018 Speaker Series presentations which so far this year have drawn an average of 170 attendees, a significant increase over the last year and a measure of the Series continuing growth through its first four years. The doors will open at 6:45 with a wine and cheese reception with the speaker followed by the presentation and a question and answer session. Admission is $10 at the door. There is no charge for students, teachers, and clergy. The final presentation of the year will feature noted economist Marcy Rossell McCarthy on Thursday, October 25 who will discuss the most important factors affecting the global economy today. 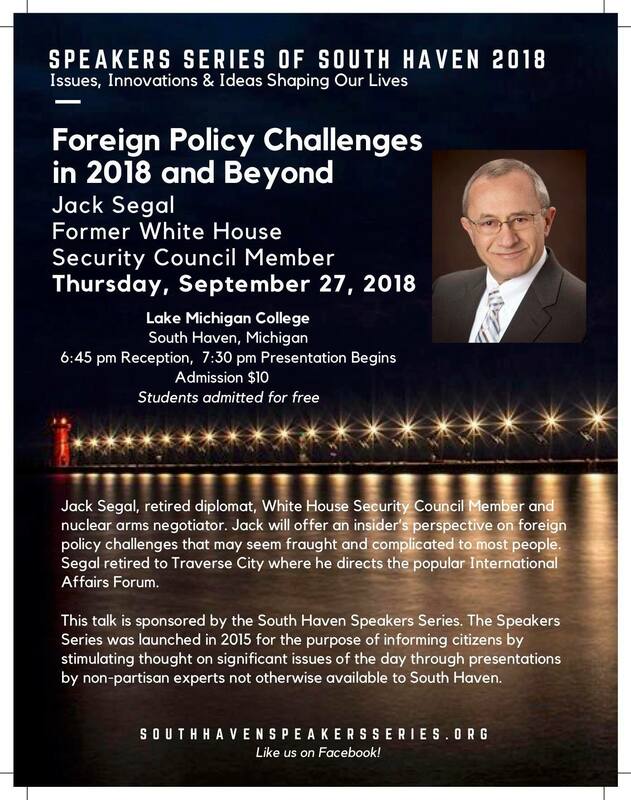 The presentation “Foreign Policy Challenges in 2018 and Beyond” by Jack Segal was well attended.